This adventure came about after I had read a 1916 newspaper article and a 1919 mining engineer's report that described an electrical power line on steel towers that had run between a power plant in Hayden Arizona and the mine camp at Christmas several miles to the north. I had grown up in the Hayden area in the 1960's and had never heard about this old line. I wondered whether there could be any remnants of it still in existence today and I decided to go investigate. Hayden is located in the south central part of the state. 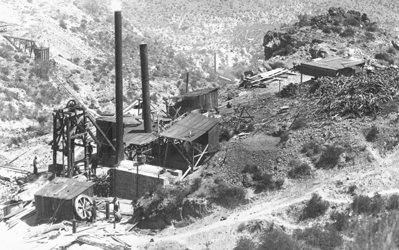 Its history is mining related and dates back to 1910 when a concentrator and a smelter were built to process ore from the Ray mines 20 miles to the west. 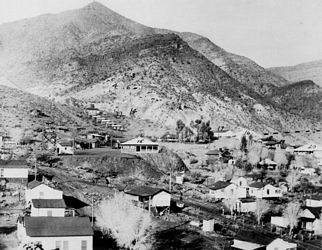 The mine and camp at Christmas originated around 1902 in the Dripping Springs Mountains north of Hayden. Early photos show that the equipment used in those days was steam powered. The engineer's report noted that with the arrival of the powerline that equpment was converted over to electricity. These views of the Christmas Mine are probably from the early 1900's. 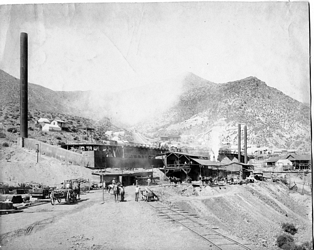 The smelter is reported to have operated from 1905 to 1907. The steam boilers can be seen to be in operation. This photo is probably from the late 1920's to early in the 1930's. The building identified as "15" is located on the site of the smelter shown in the previous photo. The camp is well "electrified". Not much remains of the old Christmas mine/town site today. The town was pretty much destroyed when operations were converted to open pit extraction. The site is very strongly posted against any entry. No trespassing signs are everywhere. This photo is a Google Earth View of the site as it now appears. The photos below show the view looking to the skyline north of the towns of Hayden and Winkelman. The old mine camp of Christmas is several miles beyond the skyline ridge. I wondered whether the towers seen up on the ridge could be related to the power line that I was interested in and I decided to start the "hunt" for it there. Up the Gila River canyon a few miles north of Winkelman a 4wd road takes off from Highway 77 at O'Carroll Canyon. A spur off of that trail crosses the canyon and meanders several miles back to the south toward the skyline above Hayden. That is the route that I took. 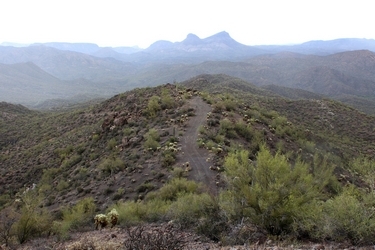 The photo on the left was taken from the spur road looking back down toward the crossing of O'Carroll Canyon. 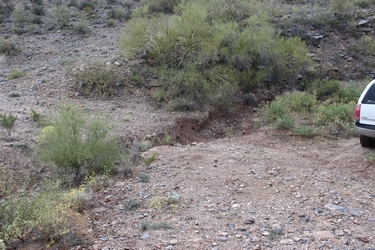 The photo on the right is looking up into the gorge of O'Carroll Canyon. A few miles after the crossing of O'Carroll Canyon, the trail passes under the active power line from Coolidge Dam at the San Carlos Reservoir. 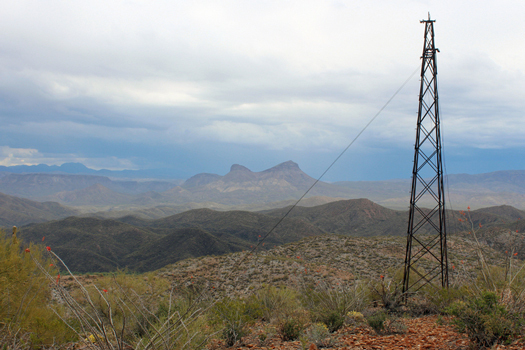 This power line was constructed in 1929 or 1930 to supply power to the mining operations at Hayden. The growth of those operations and the surrounding area had apparently created a demand for electrical power that exceeded the capacity of the power plant in Hayden. The electricity carried by the line is no longer generated at the dam. In the left photo, the tower on the skyline in the distance stands above the old Christmas townsite which is on the other side of the crest. At some point in time, the electrical system at Christmas was transferrred to this line. Travel along the 4wd trail was slow but scenic. Approximately 1.5 miles from the overlook down into Hayden, there was a serious washout in the road. It was certainly not passable to my Tacoma. So the trip became a hike from that point onward. Being out on foot was actually a good thing. I was able to look around a bit more--didn't have to concentrate on the narrow road. 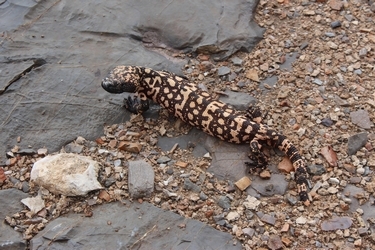 Just a short distance along the way, I came across this Gila Monster who was also out for a walk. For as much as I get out to the hills, the sighting of these critters is still very much a rarity for me. This is the view looking down on to the skyline ridge to the south. In the very far distance are the Catalina Mountains near Tucson. 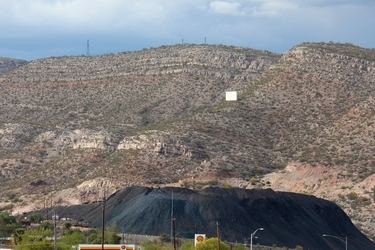 The smokestack is at the ASARCO smelter and is listed at 1001' tall. It is the tallest structure in Arizona. The towers that were my destination are just visible. While I had come to the ridge line to check out the powerline towers, I could not help but be impressed with the views down below! When I was growing up in the area in the 1960's, there were two mining companies in operation adjacent to one another. Today, those operations have been combined into one company. 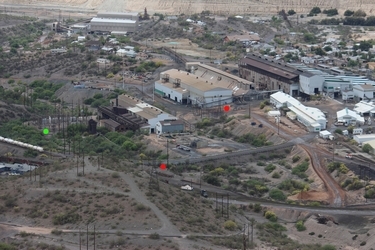 The photo on the left is the ASARCO copper smelter. The photo on the right shows the crushing and milling faciliites. In the 1960's, the crusher and the mill were owned and operated by the Kennecott Copper Company. They had their own smelter. 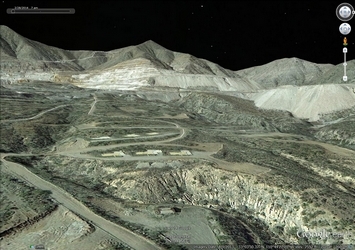 When the two companies were consolidated, the Kennecott smelter was taken down. Only its smokestack remains. 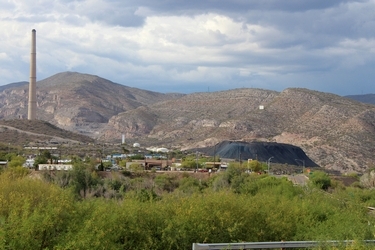 The ore that is processed at Hayden comes from the Ray Mine by train. This tower on the skyline, is part of the active line of the San Carlos Irrigation Project. This is the line that was crossed under on the way in from O'Carroll Canyon. As viewed from down in the town of Hayden, this tower is the one to the west. East of the SCIP tower are two much smaller towers. Neither is part of an active line. These structures are about 7' across at the base and stand approximaely 35' tall. It appears that the towers carried two or three lines. There is no evidence of any transmission wire/cable around those towers today. These have the appearance of being much older than the San Carlos line. 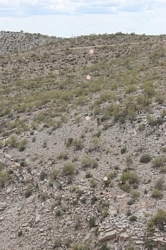 The red dots in the photo mark the SCIP towers that run to a substation down at the ASARCO plant. The green dot marks a tower that is identical to the two inactive towers seen on the skyline. The building centered within the dots is the old power plant that not only provided electricity for the reduction operations at the mill and smelter, but supplied electricity to the towns of Hayden and Winkelman, the mine at Ray, and also the electrical power for the Christmas mine. That power plant went online sometime around 1911. Just off the crest of the skyline ridge, there is an example of one of the smaller, inactive towers lying on the ground. It appears that its supports may have rusted away allowing the structure to topple to the ground. I thought that it was interesting that the tower was assembled with square headed bolts and hexagon shaped nuts. To the north, in the direction of Christmas, a line of inactive towers can be seen crossing the countryside. Those towers are roughly parallel to the San Carlos line. I am pretty certain that this line of towers was once the power line from Hayden to Christmas. Earlier in the day, I had not seen any of the smaller towers down near O'Carroll canyon. On my way back to the highway, I paid closer attention. The base supports of several of those towers were there, but the towers themselves were no where to be seen. My guess is that the structures had been removed and their materials recycled into some other use. Once I knew the path that the smaller towers were on, I walked over to the edge of O'Carroll Canyon to see how the crossing was done. There is one tower still standing on the southern(Hayden) side of the canyon as shown in the left side photo. The right side photo was taken from where the power line topped out on the northern rim(Christmas side) of the canyon. The tower on that side has been dismantled. There are a few pieces that remain. Looking further north, there are no standing towers from the inactive line that are visible. I did not have time to continue on to the crest of the mountain above Christmas to see if any of the bases are still in position. Not far west of the powerline crossings of O'Carroll Canyon, I noticed a vehicle in the bottom of the canyon. I have no idea whether it is there because of some kind of off-road accident or perhaps was disposed there intentionally. While wandering around looking at the towers, I had come across the remnants of a third "line" of some type. The wires are still running across the ground. The support structures were wooden poles. I have no information on what this line was about. Perhaps it was an early telephone/telegraph line. The dots in the right photo mark the position of 4 of the wooden poles that were seen on the hillside north of the skyline ridge. The views from the tower ridge above Hayden were great in all directions! The left photo is of Saddle Mountain to the east. This is probably the most identifiable landmark in the Hayden and Winkelman area. The green stretch in the right photo is the Gila River looking to the northeast. 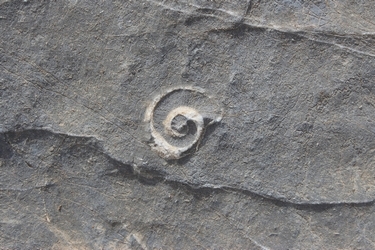 There were many fossil shells and bits of crinoid stems seen in the rocks along the skyline ridge. In addition to the power line towers, and the views down into the ASARCO plant, there are the remnants of an old limestone quarry. It is my understanding that the quarry served as a source of fluxing material for the smelter. 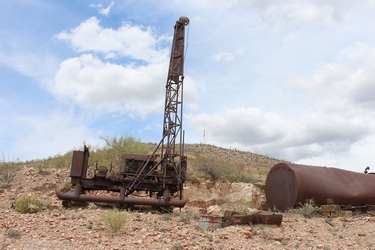 An interesting old drill remains at that quarry. It was powered by a six cylinder Waukesha gasoline engine. The drill was a Longyear brand machine. 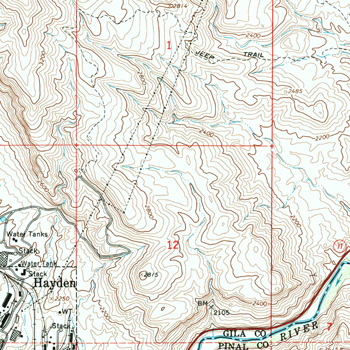 After this trip, I came across a topo map of the area from 1964. It shows two powerlines north of Hayden. They are not identified on the map. There is little doubt in my mind that the line of abandoned towers, which are on the right, made up the old powerline that once powered the equipment and town of Christmas.